HEAD down South with the Ghost Hunters crew as they investigate the spooky Pensacola Lighthouse in Florida. Tales of a ghost-like woman lurking in the halls have been passed down from generation to generation. Brace yourself as TAPS searches for clues to explain creepy transparent figures, invisible fingers tapping guests on the head and light switches turning off and on by themselves. Tune in as the team reveals some of its most startling on-camera evidence yet. 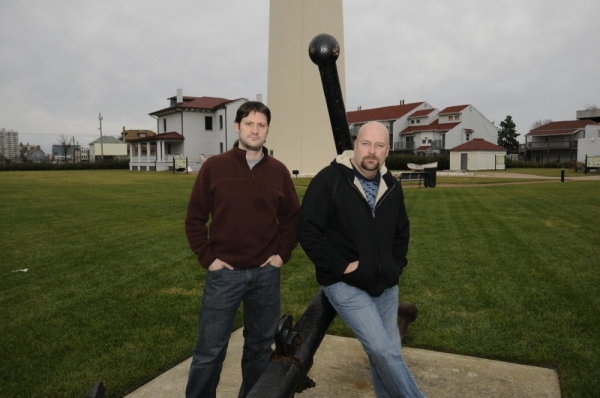 Pensacola Lighthouse airs Wednesday, November 18th @ 9 p.m. EST on The Syfy Channel. As noted above, photo by Gavin Bond and copyright of The Syfy Channel, so please no unauthorized copying or duplicating of any kind. Thanks! TAPS scales the Rocky Mountains to explore one of the most haunted places in America. Built in 1888, Briarhurst Manor is one of the oldest buildings in Colorado. Today, the home is a hotbed of paranormal activity, ranking in the Top 3 of the Great American Ghost Hunt. The shocking specter of a skeleton-like woman is claimed to haunt the premises. Shadow people and bizarre voices have scared employees senseless. The flickering apparition of a small child has both charmed and frightened visitors. Will TAPS conquer this mountain of terror? Tune in to find out! Rocky Mountain Hauntings airs Wednesday, October 28th @ 9 p.m. on The Syfy Channel. THIS week in Civil War Spirits, the Ghost Hunters travel to Thornbury Farm in Chadds Ford, Pennsylvania. Not your ordinary ranch, it was built on the bloodiest battlefield of the Revolutionary War and its grounds are allegedly haunted. TAPS is called in to investigate. Ghosts of soldiers and children are rumored to disturb the farm. Could they make an appearance for the Ghost Hunters? Join Jason and Grant as they have a close encounter with our nation’s past. The Ghost Hunters then head down South to investigate the Lee-Fendell House – the former home of Robert E. Lee in Alexandria, Virginia. The house was converted into a hospital for Union soldiers during the Civil War. Today, it is an historic museum. Visitors claim to see ghosts and feel other paranormal activity. Has the South risen again? TAPS investigates. Civil War Spirits airs Wednesday, September 2nd @ 9 p.m. EST/8 p.m. CT on The Syfy Channel. THE Sci Fi Channel comtinues the summer with its ratings driver hit reality series Ghost Hunters International (GHI) wih the premiere of season two on Wednesday, July 8th @ 9 p.m. EST/PST. The first episode of the hour-long series ventures deep into the countryside of Wicklow, Ireland for an investigation of an old 18th century prison. As these “real life” ghost hunters try to uncover truth or fiction, they’ll face their closest supernatural encounter yet! The new six-part episode season will have the team trekking around the globe with upcoming haunted haunts in countries include Chile, Ireland, the Czech Republic, Austria, Italy and Argentina. Robb Demarest – A native of Albany, New York, Robb joined the Ghost Hunters International team after three years with Florida Ghost Team, an affiliate of TAPS (founded by Ghost Hunters‘ Jason Hawes and Grant Wilson). Robb’s responsibilities on the team have ranged from research, technology management and client relations, to his current position as assistant director. As the lead investigator of the Ghost Hunters International team, Robb hopes to push the boundaries of current knowledge in the field and approach these enigmas with the open-minded skepticism for which his TAPS counterparts are known. Dustin Pari – Cranston, Rhode Island native Dustin Pari is a familiar face to regular viewers of the Ghost Hunters franchise. Long harboring an interest in the paranormal, he began his career in his teen years investigating local hot-spots in Rhode Island. He was later invited to join TAPS by Jason Hawes and Grant Wilson, and began appearing regularly on Ghost Hunters as an investigator. TAPS’ trip to Ireland in 2006 was a turning point for Dustin – during the investigation of Leap Castle, he had the most intense paranormal experience of his life when he was attacked by an unseen force in the tunnels beneath the castle. The Leap Castle investigation was his first outside of the United States and it would not be his last. Since joining the GHI team, Dustin’s role has been one of both investigator and historical researcher, uncovering the truth behind centuries-old myths and legends. Barry FitzGerald – A veteran ghost hunter with 17 years of experience in paranormal investigating, Barry is memorable to Ghost Hunters fans for his work on TAPS’ investigations in Europe during the show’s third season. Now, as a member of the new GHI team, Barry supplies his expertise in both ghost hunting as well as his knowledge of the historical locations of each new investigation. Haunted by supernatural events he experienced as a child growing up in Ireland, Barry developed an interest in paranormal research and went on to work for two different paranormal groups based in Northern Ireland. He now dedicates much of his time to the development of new investigative techniques and research methods. Brandy Green – A native of Farmington, Minnesota, it was Brandy’s childhood experiences with the paranormal that led her to spend much of her life exploring the possibilities of life after death. Brandy’s first ghost hunting endeavor began when she founded her own paranormal investigation group in the Twin Cities. Now she begins her latest feat as the Case Manager of the GHI team. After studying the psychology of death and dying, Brandy began to expand her understanding of the psychological, social and historical aspects of loss and the afterlife. She has worked to apply that knowledge towards clients and cases that her home team has worked on, as well as those that she encounters with GHI. Joe Chin – A native of North Providence, Rhode Island, Joe’s interests in the paranormal dates back to his teenage years. Growing up, he remembers that the third floor of his apartment house was always lively with instances of unexplained paranormal activity. And although he experienced the supernatural as a youngster, he had no idea that people looked for the paranormal until he met Jason Hawes. Months after meeting Jason, he was asked to join the group and several cases later he is still a part of the thriving team. Since joining the team, Joe has cultivated what he refers to as a “skeptical curious side” that spurs him to want to get to the bottom of things. He also relates this innate curiosity to being a computer technician, a trade he delves into in his spare time. When working with computers, he always has to figure out what the problem is and how to resolve it as quickly as possible – similar to the work that he and the other ghost hunters do. Ashley Godwin – A native of Winter Haven, Florida, Ashley is driven by the logical, the methodical and the scientific. Her recent years have been spent studying atmospheric science and experimental psychology. She is also a member of Robb Demarest’s local paranormal group, Florida Ghost Team (FGT). After proving to be a fearless and thorough investigator, Robb asked her to join the GHI team. Having never left the country before, Ashley thought the show would offer her an amazing chance to travel the world and explore the unknown. Though Ashley is the youngest in GHI, her expertise and insight into her field have proven to be of endless value. Nowadays, it is not unusual for someone to have two jobs, but how many people do you know who are employed as plumbers and ghost hunters? Jason Hawes and Grant Wilson are family men, longtime friends and Roto-Rooter plumbers as well as the hosts of the Sci Fi Channel reality TV series Ghost Hunters. Founders of The Atlantic Paranormal Society (TAPS), they, along with fellow TAPS members, spend one hour on TV each week investigating places that are reported to be haunted. Armed with, among other things, EMF (electromagnetic field) scanners, infrared as well as night vision cameras, and video/audio recorders, our Ghost Hunters do their best to locate, catalogue and subsequently analyze possible paranormal activity. Their small screen enthusiasm is infectious, but that was not always the case for Hawes or Wilson. “We started out as non-believers,” admits Hawes, during a recent conference call with journalists. “To be honest, it was just our own personal experiences, which we’ve always kept private, that fueled our passion to investigate the unknown. When we first got into this field, we realized that there’s a ton of garbage out there. There are people who are selling pictures of a [blurry] dot on-line for others to view in return for $3.00 a month in membership fees and stuff of that nature. When we came along, being non-believers, we looked at the field differently and were willing to call things out. Our initial investigations led to a number of people hating us because of the way we saw things and how vocal we were about it. However, over the years, they’ve come to realize that we’re going to call it as we see it. In March, Ghost Hunters returned to the Sci Fi Channel for its fifth season, which began with a visit to Philadelphia, Pennsylvania to check out an historic, and reportedly haunted, property that the legendary seamstress Betsy Ross once called home. For Hawes and Wilson, this was the start of a truly enjoyable as well as fulfilling journey into the unknown. “This is a great season,” enthuses Hawes. “We’ve investigated a lot of places and, in particular, gone back to getting a number of residential cases as well, which I think is always important. We got some terrific evidence in the form of great visuals and audio along with some other neat little things. Grant and I also kind of shook things up a little bit by buying an inn [The Spaulding Inn in Whitefield, NH) that had supposedly been haunted for the past 70 to 80 years. 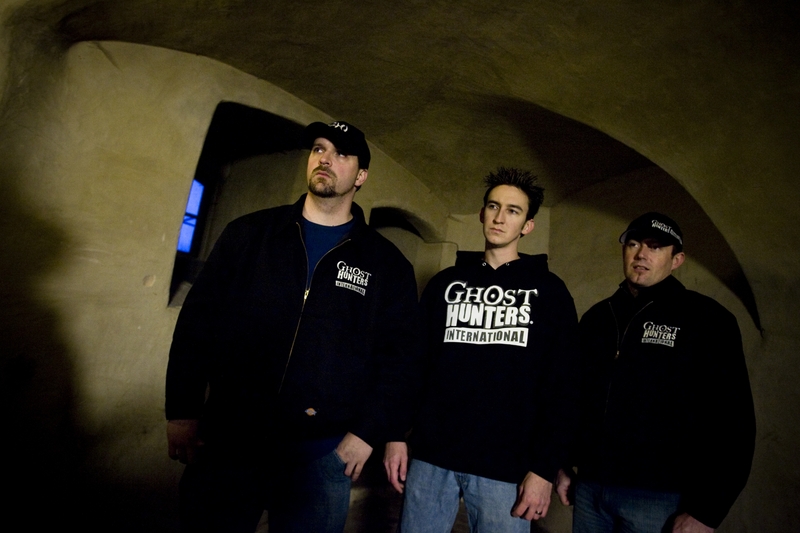 We had the GHI [Ghost Hunters International] guys come in and investigate it just so that there was no bias there. Says Wilson, “One of the coolest cases we did this season was at the Georgia Aquarium, which is the largest aquarium in the world. They have a traveling Titanic exhibit with actual artifacts from the ship, and everywhere that the exhibit goes, [paranormal] activity supposedly follows. So we caught up with it in Georgia and had an interesting time there dealing with the artifacts. We even got to climb into a six million gallon tank and swim with some whale sharks, which was incredible. Most people at one time or another have heard a strange noise or other bump in the night that, for the most part, has been air in the pipes or something other than a supernatural act. What, however, in Hawes’ and Wilson’s opinions, causes one place to be haunted and another not? “It could be anything,” notes Hawes. “We’ve dealt with places that have been 300 years old with quite a bit of activity, and other places that have been just as old but with no activity. It’s the same with brand new buildings. You find that a lot of it has to do with what happened on the property prior to the building of it, or after the structure was built and what people living or working there have since been doing there. All these factors come into play. Are you a passionate Ghost Hunters watcher? Do you long to follow in your heroes’ footsteps and do a little paranormal sleuthing? Before you head out to do so, our experts have some advice to pass on. “For one thing, stay away from the occult. Don’t go the way of the Ouija board and that sort of stuff,” warns Wilson. While some people might be reluctant to admit it, most of us are interested in the paranormal, and a show like Ghost Hunters feeds into our curiosity. While it is billed as entertainment and Hawes and Wilson enjoy what they do, they also find it rewarding for very down-to-earth reasons. “We’re always looking for that answer,” says Hawes, “and, of course, if you go for two, three, four months and don’t catch anything, it kind of becomes a downer. However, when, all of a sudden, you catch a great piece of evidence, it boosts your inspiration back up and keeps you going. As noted above, any and all photos are copyright the Sci Fi Channel, so please no unauthorized copying or duplicating of any form. Thanks!